A new Alexander Payne film is cause for excitement. The director behind Nebraska, The Descendants and Sideways has a knack for offbeat human stories which are not without their quirks. 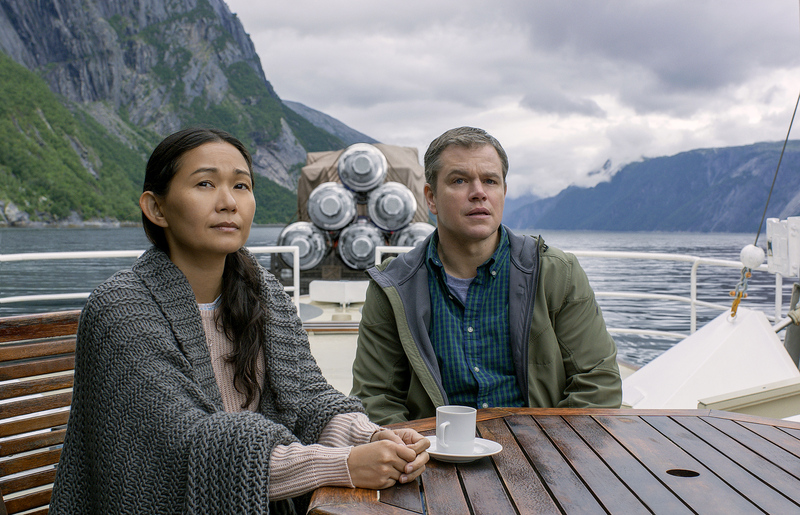 For his latest effort he turns his hand to something more overtly quirky, setting his film in a world where over-population has been tackled head-on through the process of ‘downsizing’, a procedure which shrinks people down to five-inches tall and moves them into miniaturised communities. That is some high concept stuff for Payne, and sadly his passion project is one that deflates under the weight of its own ideas, resulting in a meandering endeavour which never sticks the landing. Matt Damon plays Paul, a physiotherapist whose life hasn’t quite gone as planned. When he and his wife (Kristen Wiig) are inspired to downsize themselves, Paul begins to look at this direction as a means of reinventing himself. The small world, however, has different plans in store for Paul. 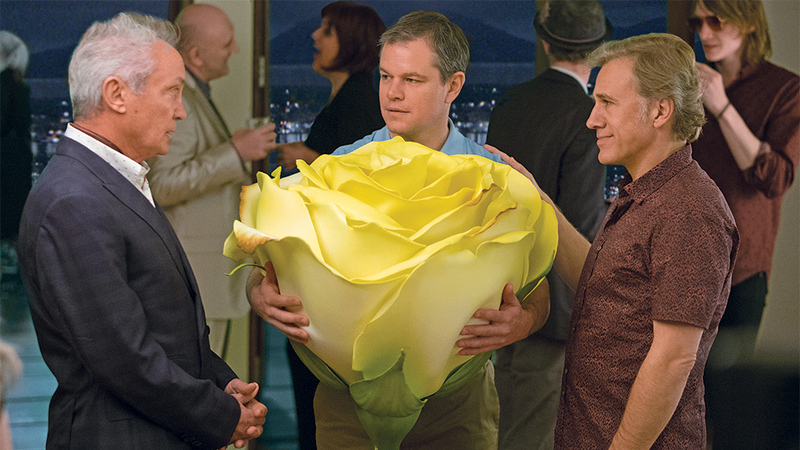 A lot has been given away about Downsizing in its marketing, so I don’t think it is much of a spoiler to say that Paul’s wife leaves him to get downsized alone, leading him to face a five-inch tall life as a single divorcé. Surely you’ve got the makings of an inspiring, perhaps Capra-esque tale of a man taking life by the reigns and enjoying all the splendour that this shrunken world has to offer. This is not the case. While there are elements of that in play, Downsizing soon ends up becoming tangled up in far too many concerns and ideas than it knows what to do with them. Before Payne truly gives you a chance to take in the wonders of the smaller world, he jumps the clock a number of years to enable the plot to not only be a look at the over-population of the world but also a satire of white liberal privilege, global warming, mass consumption and government negligence. The issue is that the film never fully commits to one idea and is moving on to another one before it has said anything all that interesting or nuanced about any of the numerous concerns it’s presenting us. It doesn’t help that Payne and his co-writer Jim Taylor go down the eye-rollingly well-trodden route of the white saviour narrative in a second half which truly goes off the rails. Damon is a dead weight as a lead, rarely making the case that we should care about his over-entitled character Paul. This means the overly long 135-minute proceedings are exceedingly dull, despite some of the baffling turns the plot takes. I rarely look at my watch during a film, but there came a point in Downsizing where I gazed down at my watch-face, judged that there was probably about an hour left and I profoundly didn’t give a damn about anything that was happening. Payne simply does not seem to be a director who is all that gifted when it comes to world building. He has made great films in the past, but their strengths have laid with their characters, characters who discuss and talk like recognisable human figures we can pick out in our own lives. The admittedly quirky concept at the heart of Downsizing simply doesn’t offer that. While you would think there is room for some playful visual inventiveness, Payne always seems to sidestep it to make room for ill-judged thematic concerns. Downsizing is an infuriating time at the cinema. You’re looking at the screen, gazing at a film made by a director whom you greatly admire, starring people you’ve enjoyed in other films in the past. Yet, the film in front of you in a bafflingly dull, meandering movie with so many uninvolving threads limply weaving through each other that finally the person holding onto them simply gives up and lets them flop to the ground having wasted their (and everyone else’s) time.